While the iconic Kind of Blue album is in the collections of most jazz listeners already, the significance and influence of this recording argue for featuring it in this, our first issue of Seacoast Jazz Notes. On April 2, 1959, the Miles Davis Sextet went into a New York recording studio for the first of two sessions that produced what is reportedly the best-selling jazz album of all time, the album considered by many critics to be the greatest jazz album ever recorded and Miles Davis’s single greatest musical achievement. The players were Davis (trumpet), John Coltrane (tenor sax), Julian Cannonball Adderley, (alto sax), Bill Evans (piano, 5 tracks), Wynton Kelly (piano, 1 track), Paul Chambers (bass) and Jimmy Cobb (drums). Prior to the time of the recording, Miles had been experimenting with “modality” in jazz, an alternative to improvising on chord changes, a system that instead uses scales or a series of scales as the basis of improvisation. In fact, the title track of Miles’s earlier Milestones album was an experiment in modal jazz. 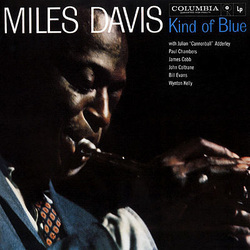 But Kind of Blue was the first album that Miles prepared entirely based on modality. Not long after this seminal recording, Miles moved on to form his next great quintet, the one with Wayne Shorter, Herbie Hancock, Tony Williams and Ron Carter. Bill Evans went on to lead his own trio for the rest of his life. John Coltrane formed his own quartet, also singularly influential. Cannonball Adderley formed his group, which was highly successful. And Jimmy Cobb, the only member of that illustrious sextet still alive, today leads the “So What” band, an ongoing tribute to Miles Davis and to the sextet whose album Kind of Blue was released on August 17, 1959, and presaged the next era in jazz.